Home» Blog » What Can the South Dakota Small Business Development Center Do for Entrepreneurs? Imagine an organization funded by the SBA, the DoD, the Department of Commerce, and the SDGOED, chartered by USD, and operating under the names SBDC, PTAC, MTS, and SBIR. If you think that getting help from this organization must be like visiting the DMV, you would be mistaken. It turns out that the South Dakota Small Business Development Center (SBDC) is a high-quality resource that’s easy to work with. All you have to do to get business help is call your local small business counselor and set up an appointment. If you’re in the Sioux Falls area call the local office at 605-367-5757 and you will be directed to the person who can help. The SBDC has about twenty-six staff members across South Dakota, and about half of them are general business counselors. The rest offer guidance in specific areas, such as manufacturing, contracting with the government, international trade, or research and development grants. Jeff Eckhoff, who is the director of the South Dakota SBDC says, “Most of our counselors have a twelve to fifteen year tenure with the SBDC and many have prior business or banking experience.” They can quickly get you the advice, information, or business contacts that you need. South Dakota’s SBDC and the organizations under them serve over 2,000 clients a year. The two things they help with most often are regulations and financing. Because the SBDC is a government entity, they are very good at helping businesses relate to the government. They are strong in the areas where many entrepreneurs are weak: paperwork, bookkeeping, financing, permits, contracts, business structure, and taxes. As an example, during an appointment with an SBDC counselor, someone starting a service business can get advice on setting up the appropriate business structure and getting any other licenses or permits they may need to set up business. The new business owner can come in for a follow-up appointment as often as they need to make sure all these things have been done in a timely manner and that everything is as official and organized as it should be. A more experienced business owner might contact the SBDC for the same assistance or to do a yearly review of their financials with their SBDC counselor. This is a good way to look back at what’s been working well, make sure everything is staying organized, and make plans for future growth. Jeff Eckhoff says, “The biggest myth about the SBDC is that we’re only there for startups.” The SBDC has services for every stage of business growth. An SBDC counselor can point out other resources that apply to certain fields. Manufacturing businesses can connect to a Manufacturing & Technology Solutions (MTS) advisor who can help improve the efficiency of an assembly line, streamline office operations, and lead strategic planning with an eye to improving profitability. Companies can find out about government projects to bid on through the Procurement Technical Assistance Center (PTAC). The Small Business Innovation Research (SBIR) branch provides assistance with product development and market research. 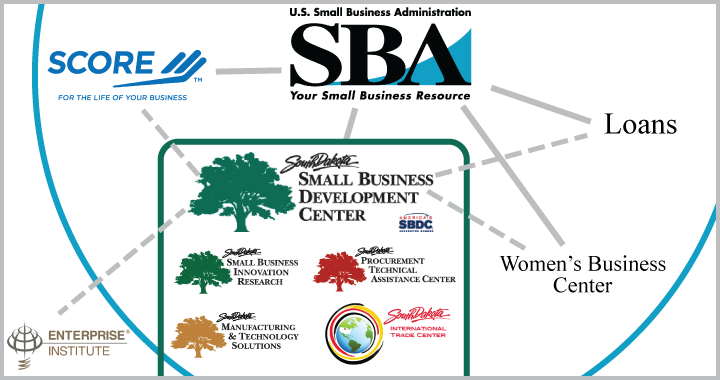 These and other resources can be accessed through your local SBDC office. A directory of resources and specific contact information can also be found at sdbusinesshelp.com. One of the core services of the SBDC is to help companies obtain financing for their businesses start up or expansion. Whether accessing Small Business Administration (SBA) or traditional bank financing, the SBDC can assist your company. There are two types of SBA loans. The first type, 7(a), are loans that are made by banks but guaranteed by the SBA. These loans protect the bank from loss which may allow the borrower to put less money down, receive a better interest rate or lessen requirements for collateral (specific property that can be seized if the loan isn’t repaid). With SBA 7(a) loans, it’s up to the bank to decide if the company can afford to repay the loan based on their cash flow. The second type, 504, are loans directly from the SBA, made in partnership with the bank or other lending source. These loans offer long-term fixed interest rates and take a second mortgage position to the bank, which also may allow the borrower to put less money down and provide less risk to the bank. The SBA 504 loans are used to purchase equipment or real estate while the SBA 7(a) loans can also be used for shorter term debt and working capital. To get any type of business loan, a business needs to have a well-formatted, well-researched business plan, and the SBDC can help a business put this together. They help hundreds of businesses with this task every year, and it’s one of their specialties. Besides helping a business qualify for a loan, a business plan can be a vital tool for an entrepreneur to evaluate and plan for their business. A formal business plan is also a must for businesses seeking equity investment. Many entrepreneurs don’t realize that they can get all this help for free. Others think that, because it is free, that the help won’t be of high quality. Jeff Eckhoff tells this story: “A business came to us to see if we could help them with a thorough financial review as they were changing ownership, and we could. At the end of the process, the business owner said to me, ‘People have got to know about this. The quality is as high as any place else we have worked with and the turnaround time was very fast.’” SBDC counselors are experts at what they do. Making connections is a large part of the SBDC’s work. Whether you’re looking for someone to help you with your business plan or someone in your industry to answer a specific question, the SBDC is a great first call. “Call us. We’ll help you,” is Jeff Eckhoff’s straightforward advice. In case you missed it, the SBDC in the Sioux Falls area can be reached at 605-367-5757.